← When to exit Malaysia Stock Wintoni (0141)? Depending On Salary Alone is Not Enough! In Malaysia [Plans] salary increases, cannot keep up in tandem with changes in Inflation rate. Worse still…. infuriating words from your boss may make you an unemployed. Definitely a struggle for a wage earner. More frightening is yet to come! Good and Service Tax (GST) is to be implemented very soon come this April! Phone reload cards, home appliances, computers, movie tickets, etc, all will be levied GST! That’s why for a Malaysian to rely on one source of income is insufficient! Anxious to increase your income sources but lack ideas? Then, let’s start to invest in FOREX. Based on the SPICY CHILLI signals provided by INSIDERS, we go for SHORT (Sell) when the red empty dot appears, until the next red full dot appears. When the red full dot appears, we close the SHORT position, then open the LONG position and hold it until the next red empty dot exists. Is as simple as ABC, use red EMPTY dot to do SHORT and red FULL dot to do LONG. According to the chart shown, investors just need to follow the SPICY CHILLI signals to arbitrage almost 1, 836 pips without any difficulties! Doesn’t require whole day monitoring. At such, you don’t need to quit your current job to earn an extra income! 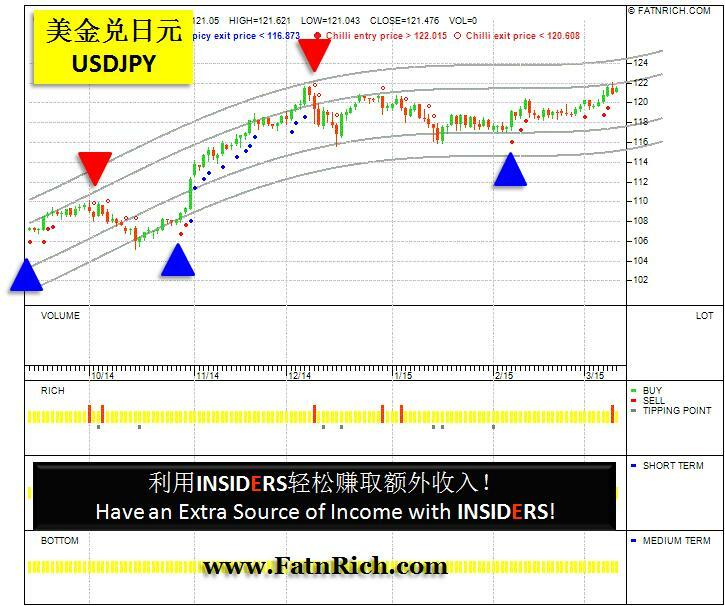 You are welcomed to discover more about INSIDERS FOREX ——the Forex Trading Software. This entry was posted in Forex and tagged currency exchange, extra income, Forex, Forex Trading Software, GST, investment tools, USDJPY. Bookmark the permalink.